Your realm for all things immersion tech in education & business. Charlie talks about his love of musicals, his time at Disney (including an awesome Lion King story), and there is some immersion tech mixed in there somewhere. Charlie Fink: From Disney to Virtual Worlds...Part 1! Author, speaker, Forbes journalist, ARVR enthusiast and influencer Charlie Fink joins the conversation to talk about augmented reality, virtual reality, artificial intelligence, 5G, and the kitchen sink! This is part 1, so make sure to check out the next episode after this one. Hold onto your hats! In Season 2 Episode 5 we interview Luis Chavez and Dmitry Shapiro of Metaverse and discuss their Augmented Reality creation platform and use cases. There is a special reveal about a new platform, and also the new collection feature. SPONSOR THE VRPODCAST! Are you an ARVR platform in the education or business realm and want to extend your reach? Consider sponsoring the VR podcast. With a global audience and robust immersive content, we can get your platform in the ears of a niche audience. Email us at theVRpodcast@gmail.com to find out more. We appreciate our listeners and sponsors! Check out some our sponsors below! Not only do they sponsor us, but we use and endorse them! Rumii by Dogheadsimulatios Distance.Travel. Costs. Distractions. These things can be barriers to getting business teams and students together to focus on what on what matters—the problem and curriculum at hand. 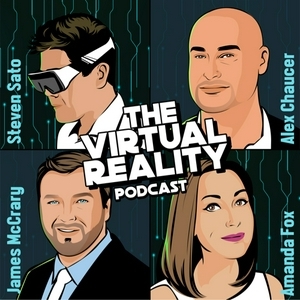 As hosts of the VRPodcast we live across the US — Louisiana, New York, California and Kentucky. Rumii is our go to multi-platform meeting space that eliminates these problems by bringing all of us together in VR, no matter where we are. With features like a 3d model viewer, digital whiteboard, screen and file sharing, we can share our ideas in multiple ways without distraction while being completely immersed in the tasks at hand. Head to DogheadSimulations.com and sign-up for a free trial of Rumii. When you’re ready to subscribe email contact@dogheadsimulations.com and mention the VRPodcast to save 10% off your monthly subscription price or 20% off a pre-paid, annual subscription. CospacesEdu If you are an educator and VR fanatic like us here at the VRPodcast, then you need check out CospacesEdu. CospacesEdu is an intuitive education technology enabling students and teachers to build their own 3D creations, code them, and view them in Augmented or Virtual Reality. You can get started for free at Cospaces.io or you can check them out on the App store on apple and google play. CospacesEdu. Make AR and VR in the classroom. This week on the Virtual Reality Podcast we have a special guest who currently lives in Dubai and does quite a bit for Virtual Reality and education, mainly focusing on high end virtual reality experiences, like those on the HTC Vive platform. His name is Steve Bambury. From film maker, to Ipad expert, to top VR Influencer, Steve Bambury helps bring educators from around the world together in Virtual Reality. Steve is the head of digital learning and innovation across the JESS Dubai school system. He is an Apple Distinguished Educator, a Microsoft Innovative Educator Expert, a two time winner of the GESS Award for best use of ICT, winner of the BETT MEA Innovation Award 2018, and was named 2018 Trendsetter in the Edtech Digest Awards. Currently Steve shares his experiences and research on a website called virtualiteach.com. His CPDinVR events bring together educators and experts from across the globe for professional development panel discussions in VR. He has produced numerous iterations of the periodic table of ARVR apps, and is currently curating subject specific playlists on Youtube for VR experiences. But above all, Steve is a nice guy who is always willing to share his love for Virtual Reality, and he was the first person I ever connected with in Virtual Reality when I first put on my HTC Vive and launched into the Engage platform. It is a privilege and honor to bring Steve on this week and to interview him on the the Virtual Reality Podcast. We interviewed Shawn Young from Classcraft and discussed VR integration, and how to craft VR quests with the engagement management system. In part 2, Dr. Bailenson shares what VR should be reserved for by introducing the acronym D.I.C.E. And of course, the VR Podcast crew throws their two cents as well! s2e1 Dr. Jeremy Bailenson & Experience On Demand...part 1! Dr. Jeremy Bailenson joins the island of misfit toys and talks about VR, AR, and his book, Experience On Demand. Dr. Bailenson is a Stanford Professor and founder of the Virtual Human Interaction Lab. You can follow him on twitter @StanfordVR and check out his book at experienceondemandbook.com. His discussion was so awesome, we had to separate it into two episodes! If you like this episode, tune in to part 2 or check out our other episodes. Kevin Chaja of EQtainment and Jeremy Kenisky of Merge join as guest hosts to talk about ISTE and the buzz around immersion technology at the 2018 conference. Recorded on site at McCormick Center in Chicago. The VR Podcast talks to France-Lee, Program Manager at Google about Immersion Tech at ISTE 2018. In the season finale, the gang explains all the confusing and complex terminology surrounding immersion tech to help educators get their feet wet! And also cool free giveaways at ISTE 2018 in Chicago! Included is the difference between "Yaw" and "Y'all." In this episode things get squirrely yet again as we interview Mat Chacon, CEO of Dogheadsimulations, and learn more about his background, Rumii’s VR conferencing platform and features, and the story behind the dog behind the headset--you know the one in their stellar logo! ISTE! ISTE! ISTE! The gang talks about events to check out in Chicago for ISTE 2018 June 23rd-27th. You can also find out how to get yourself some The VR Podcast swag! Brian Costello joins the gang to talk EdTech philosophy, CoSpaces, 80s nostalgia, and microwave burritos. This week, the gang talks to #ARVRinEDU moderator and author, Jaime Donally about her new book, Learning Transported. Join the gang as they try to convince James to use immersion technology, especially virtual reality for fitness...and James takes on a challenge. s1e6 Oculus Go, Go Gadget VR! Listen in as the crew has an unedited convo about their first impressions of the Oculus Go and where they see it fitting in to education...if it does at all! And of course, they try to set the record for most inside jokes possible...just for your listening pleasure! While the gang is away, James will play! In this episode, James talks about the future of The Virtual Reality Podcast and how to connect with The VR Podcast crew virtually and in-person. In this episode, Amanda is on location in Tanzania while the boys hold down the fort! Join them as they talk about existing technologies found in RP1. In this episode, the gang talks about safety concerns from Ready Player One and how it might give insight to our current interaction with virtual environments in education, like social media. And Amanda schools James about Kid President. In this episode, The Virtual Reality Podcast crew talk about equity and poverty by pulling in parallels and symbolism from Ready Player One. In this episode, The Virtual Reality Podcast crew tackle the themes from Ready Player One that can have an impact on education.